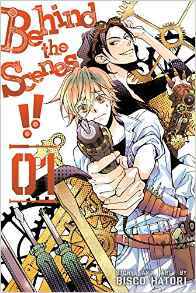 From Bisco Hatori, the creator behind Ouran High School Host Club, comes a new manga in which the protagonist, Ranmaru Kurisu, is a complete and total basket case. He believes everything is his fault and is constantly apologizing. He comes from a family of fishermen, but his weak and frail body causes him to be the subject of ridicule. One day while attending college, he accidentally stumbles onto the set of an amateur zombie movie. After inadvertently ruining the take, he is brought to the art club in order to help them with making props as a way of apologizing. Ranmaru, however, is discovered to be a diamond in the rough and could be a huge asset to the club. He finds himself coerced into joining, but can he keep up with the demands of his superiors? Having seen Ouran High School Host Club, I had an idea of what to expect in terms of writing style, but even with that, I was pretty disappointed in this first volume. The volume is extremely fast-paced and it throws scene after scene at you with very little time to digest what just happened. From beginning to end, this manga seemed like a fiasco and the sloppy art didn’t help things either. Close-up shots of the characters were rather drawn well, but it seems the same pose was used over and over again with little variance. To accompany the fast-paced style, the rest of the art seemed exaggerated and poorly drawn. Sometimes the characters even lacked basic features in the background making it difficult to remember them. That’s another thing about this volume that bothers me is that the author throws a LOT of characters at you all at once. We get a page dedicated to the art club members so we can see their names, their major, and what year they are in and then after that, they just expect you to remember who is who. With the poor art throughout the volume, it made it difficult trying to recognize who was who. If trying to learn the art club was bad enough, they mention there are different film clubs as well and we are introduced to two of them in the first volume. It’s quite a rather large cast that could have benefited from slower pacing. I got the gist of the story as I read through the volume, but I’m already annoyed with the main character constantly apologizing for every little thing. I understand he’s paranoid and perhaps has anxiety issues, but there should at least be some realization his talents were being appreciated rather than feeling like the center of everyone’s failure. Not sure if I would even give volume two a try, though. This was just simply a mess that was a very tough read. This was seriously painful to read. I was excited at first because I enjoy comedy/slice of life manga but this was just a hot mess. It took me several sittings to read through this and I couldn’t spend more than ten minutes trying to figure out what I was following. At first I thought, “well maybe it’s just me,” but then Josh had the same complaints I did so it really isn’t ‘just me.’ The art style is sloppy and I often had to flip back and forth to figure out who was who. I couldn’t keep the voices straight in my head. There are just too many characters in the first volume alone that I am seriously afraid of what will happen in volume 2. I can only imagine more of the same. Ranmaru is also incredibly annoying. He is so apologetic that I want to just throw this book out a window – seriously. I can only hope that the author is parodying this archetype but I have the feeling we’re supposed to accept Ranmaru as a cowardly, easily frightened college student. His one redeeming trait is his artistic talent, which doesn’t seem very unique in a volume of 20 something or so characters (I didn’t actually count) who all have a skill that is useful in the production of a movie. Overall, I found this first volume to be sloppy from story to character development to artwork. I can’t possibly see this improving in volume 2.